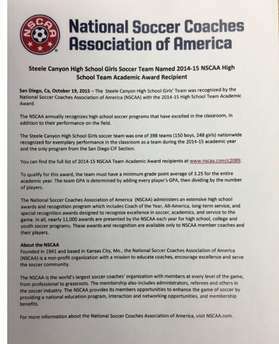 Steele Canyon High School Women's Soccer: My Site News: COUGARS NAMED 2015 NSCAA NATIONAL ACADEMIC AWARD WINNER!! COUGARS NAMED 2015 NSCAA NATIONAL ACADEMIC AWARD WINNER!! Cougars named as a NSCAA National Academic Award Winner for 2015! One of 5 California schools and only one from the San Diego CIF Section!